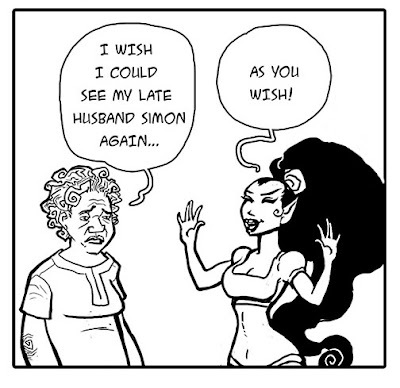 The Art of Samax Amen: Did you catch the latest DJINNX episode I drew for J.R. LeMar's comic strip site? I love drawing comic strips! Not to toot my own horn, but I'm pretty good at it, even when my client isn't super confident as a strip writer. I've been doing character art commissions with J.R. for years before I offered to draw comic strips with him, so I already knew he had quality ideas, but he still wasn't very confident that he could write a good strip. After a short conversation with me, J.R. started his awesome website MyComicStripClub.com, where he has collaborated with multiple artists to make strips. So far in 2018, I have collaborated on 12 strips with J.R., including this one, which dropped on Halloween. I am confident I can turn anyone into a comic strip writer! So if you want to write comic strips for fun or for business purposes, CLICK HERE to schedule a free 15 minute discovery call, or just email me here so we can unlock your inner comic strip author.